With the two major Party conventions coming up I thought it was time to get out the first electoral map of the 2016 season. Important to note: I am a Democrat, but I will call them as I see them on this map. What I put up is what I think will happen, not what I want to happen. Some folks have difficulty with that concept but I can assure you that I do not. So let us look at the map. California (55), Connecticut (7), Delaware (3), Hawaii (4), Illinois (20), Maine (4), Maryland (10), Massachusetts (11), Michigan (16), Minnesota (10), New Jersey (14), New York (29), Oregon (7), Pennsylvania (20), Rhode Island (4), Vermont (3), Washington (12), Washington D.C. (3), Wisconsin (10). That is a staggering 242 electoral votes, and presents a major challenge for any GOP nominee. Trump has stated that he will be able to pry open that “Blue Wall” by appealing to disaffected working class Democrats and broadening the electoral appeal of the GOP. Although the Trump campaign has stated their belief that they could put some of those states into play they have not been entirely focused into areas where they could arguably do so. (Mentioning that New York, California, Washington State, Oregon or New Jersey might be in play for the GOP is delusional.) I would have to believe that political pros would look at that theory as having potential in Ohio, Wisconsin, Michigan, and PA. Which “blue wall” states have I assigned to “undecided” or to the GOP? I have assigned only PA into the undecided column, with 20 electoral college votes at stake. I have also placed one Maine Congressional District into the “undecided” column (3 votes for statewide winner, with potential for statewide loser to pick up one vote by winning one of the two Congressional Districts.) The likely argument from from those that hope to break that wall? My assignment of Michigan and Wisconsin into the blue column, and possibly the inclusion of North Carolina into the undecided column. As we speak the available polling just does not justify moving them, but if the Trump theory proves true maybe they will move in the months to come. 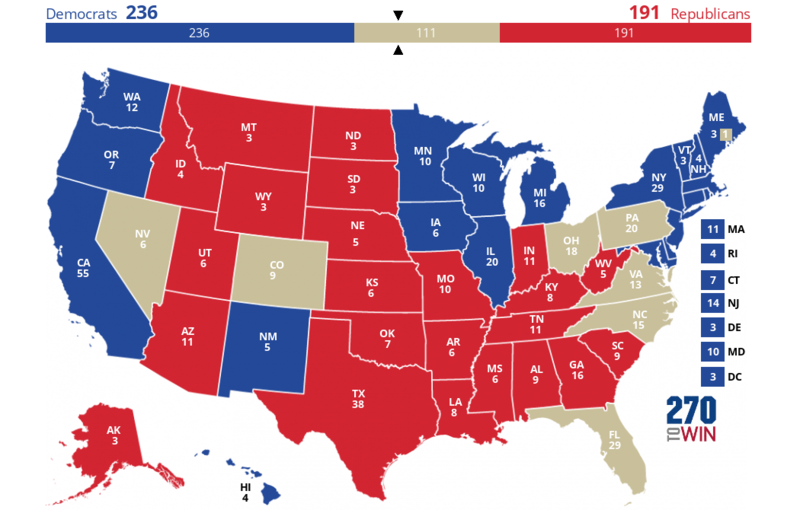 So how does Trump win with this map? I think North Carolina is still “lean Trump,” so I think he needs to run the available table by winning Ohio, PA, North Carolina, and FLA. That is, in my view, an uphill fight. FLA in particular seems to be slipping away from the GOP, with the Trump problem with Hispanic voters making victory there for Trump difficult. What about Clinton? Her path to victory appears to have more potential by virtue of this map. I count Colorado and Nevada as likely Clinton, although available data makes me reluctant to push them blue just yet. If Clinton simply wins PA and FLA under this scenario she is over the top. Under those conditions she could lose Ohio, North Carolina, Virginia, Nevada, and Colorado and still win comfortably. What about one scenario that is not on the map? If Clinton wins PA, FLA, VA, CO, and NV she could lose Ohio, Michigan, and Wisconsin and still win the election. It is hard for me to see how Trump wins without winning FLA. If both pick the same candidate to win whoever picks the higher amount of states correctly wins. In the event of tie both contribute the agreed upon amount to charities of their choice. Why not wait until November 1? I guess that might make sense if we were going to stop talking about the election until November 1, but with all this talk going on about who is going to win let us see, for those predicting victory for one or the other, how that victory will occur. We could certainly use some of that charity money up this way, so I hope Teddy takes up the challenge, and shows us the Trump Victory map. This entry was posted in Electoral Map, National News and tagged Electoral College 2016, Manzi Electoral Map, Panos Electoral Map. Bookmark the permalink.